Popups were an understandable workaround for the shortcomings of the iPhone operating system. But with OS 4, Apple missed their chance to build a good alert system. Now, popups are about to get way out of hand. You deal with plenty of popup notifications on your iPhones right now. A Facebook message interrupts while you're checking on an IM which interrupted you in the middle of reading an SMS which popped up over the game you were playing. And whenever you're interrupted, there's no quick response, except to ignore the popup completely. And even then, it's hard to ignore it quick enough to avoid getting killed in whatever game you're playing. The trouble is, this is only going to get worse. 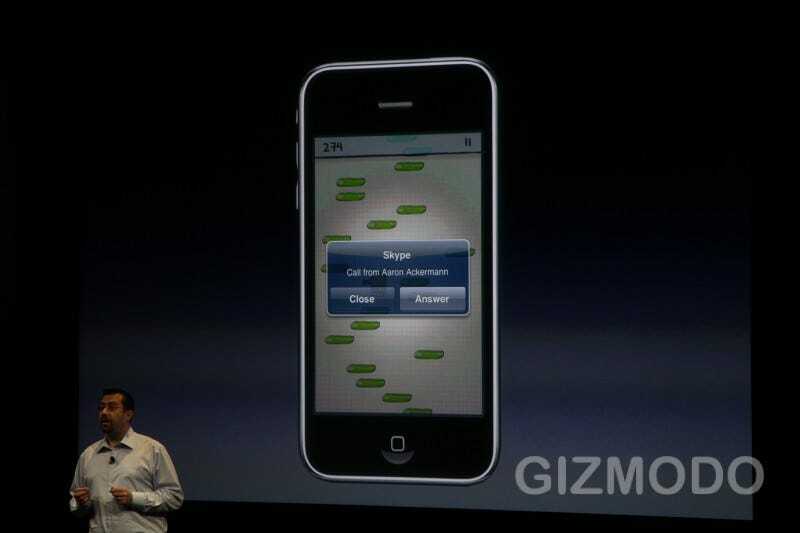 On top of push notifications, Apple's iPhone OS 4 adds local app notifications. Any app running in the background that feels like bugging you for whatever reason can, whether you asked it to or not. This is manageable, but sometimes the choice of whether to be notified or not is tricky. Suddenly a convenience turns into an annoyance. Steve Jobs tells us that Apple takes its time on things (like copy and paste and multitasking) in order to get them right. When they finally do execute, goes the speech, they handle these things better than anyone else. But there's no end to this popup notification hell, and someone else already handles notifications better than Apple does. Who? Palm, that's who. On smartphones running Palm's webOS, a small, nonintrusive tray nudges things up just a tiny bit to notify you of events, be they IMs or songs changing on Pandora. Once you choose to, you can either take an action and respond to the notification right through the tray, or put it out of sight and ignore it. Even an alert system as simple as Android's, which consolidates notifications into a tray after briefly flashing them in the taskbar, would be fine—unlike the iPhone's which makes notifications disappear once you ignore them. Of course, no one's expecting Apple to copy Palm—or anyone else for that matter—but there are better options and approaches already out there. Apple needs to consider that endless popups right in the middle of our greasy screens are a problem to fix, and not a solution in and of itself.